We were challenged to take a plain wood crate and make it Christmas festive. I bought three and plan to use them under my Christmas tree. First I spray painted the inside with Rustoleum’s Painter’s Touch 2x Ivory Bisque. Large wood snow flakes at Hobby Lobby were perfect for an accent. I spray painted them the same ivory bisque as the box interior and then sprinkled silver glitter on it to give it some pinache and then hung it on a nail on the box. It took a bit because it was 10 degrees outside and since I paint out on my front lawn, it was interesting to say the least. I painted a bit, brought it in to dry and took it out for more paint an hour later. After a dozen ins and outs, I finally got it painted. Annie Sloan Duck Egg Blue was the perfect choice for an accent color. I painted it on the outside slats and side solid wood with a foam brush. I’ve been itching to use this paint. I’ve had it a few months. My big project for Annie Sloan will be an antique china cabinet, but that’s down the road. Love, love, L.O.V.E. 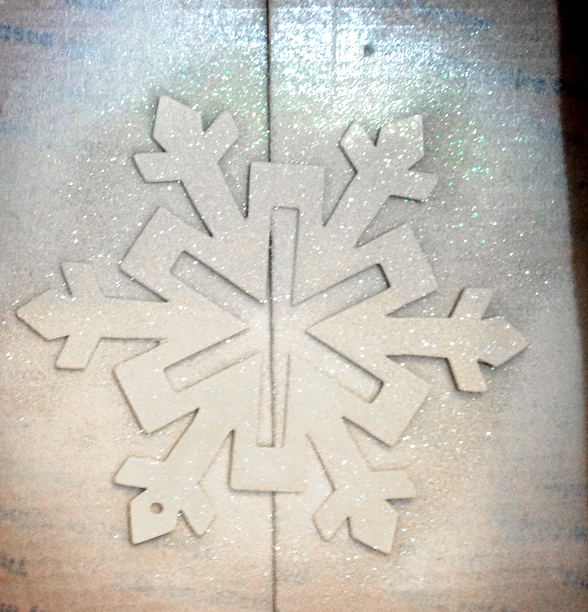 glittery snowflakes! 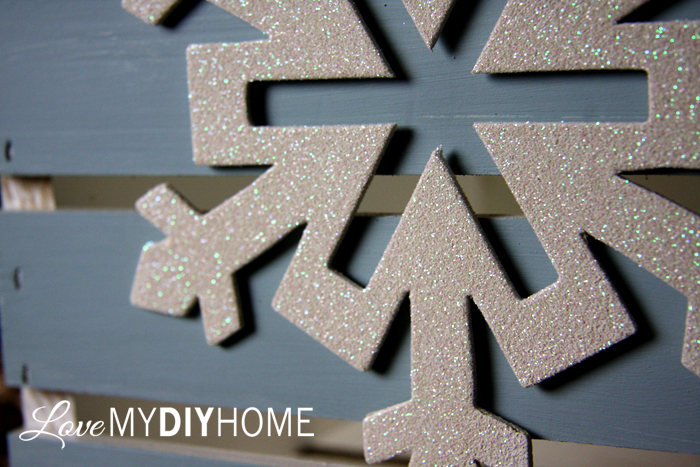 This is an easy DIY for you to do this year for Christmas. It would make a great Christmas gift caddy to use rather than traditional gift wrap. Or you could use it to hold wrapped gifts under the tree – which is what I intend to use it for. If you would like me to send you my free printable Homemade Chalky Paint Recipes just click! What are your Christmas decorating plans? 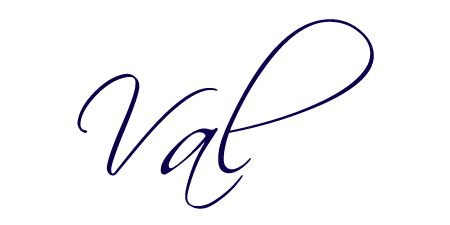 November’s Fab Furniture Flippin Contest – Take a Seat! Your crate turned out beautiful. I love that can be used for many purposes and really you could keep it out all winter. Nice! Val this is great! I love snowflakes it's the perfect theme because you can use these creates through January too. I can see them filled with pine cones for the fire place, they would really pop off that blue. I love that color! Thanks so much for joining in with this project, had a great time working with you. Thanks, Carole. Your pine cone idea is a good one! You're so creative, Val! I love the pretty snowflakes – which are totally foreign here! The duck egg blue and bisque paints are so pretty together and I love the idea of using the crates for holding gifts. You inspire me! It's been fun working with you on this project – hope we'll do it again! Thanks, Karen. I saw your kids staining your box on green grass. We have snow and slippery roads here! SUPER cute idea, Val! 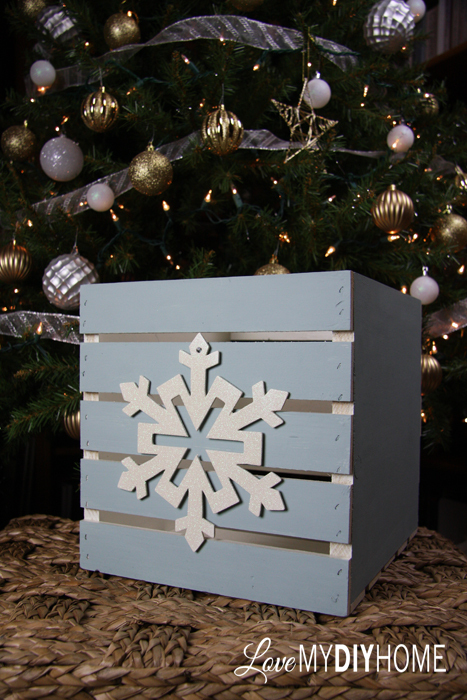 I LOVE the color you chose for your crate-and for someone who lives in Minnesota (me), the snowflakes are the perfect accent!! Thanks, CD. We are seeing lots of real snowflakes today! So pretty. 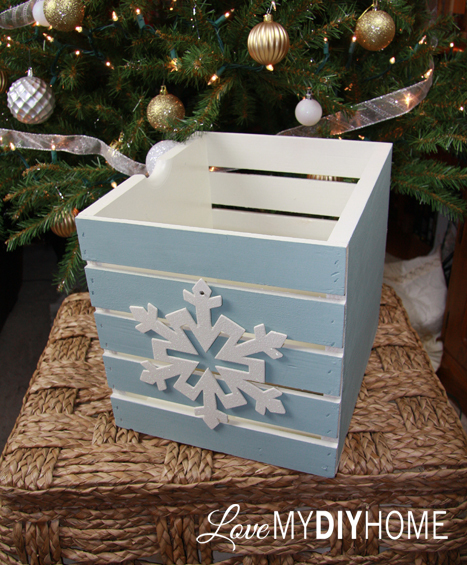 I love how this crate turned out… the AS Duck Egg Blue paint is the perfect backdrop for the sparkly snowflake! It's been so fun working with you and the other ladies on this challenge! Have a wonderful week! Thanks, Nici. Blue and ivory go together so well for winter projects. Thanks for visiting! Val, I love how pretty your crate looks with the blue and white! 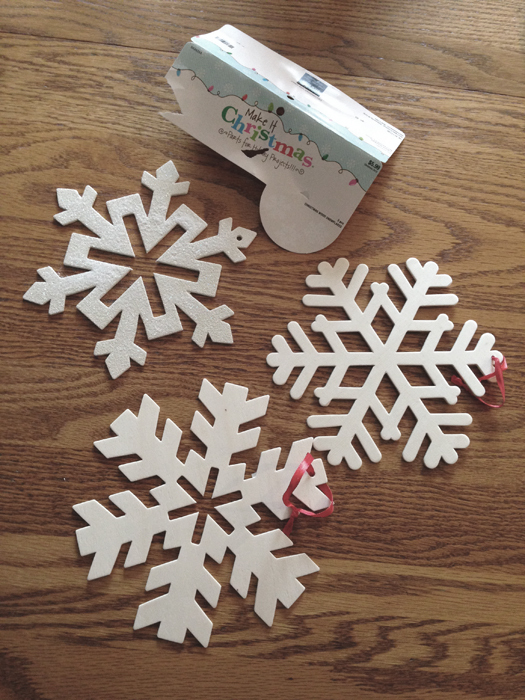 The snowflake is just perfect, and it looks great with your tree. What a fun project! Thanks, Meredith. We put up our tree just for that photo. Otherwise it might have taken till Christmas Eve to get it up! 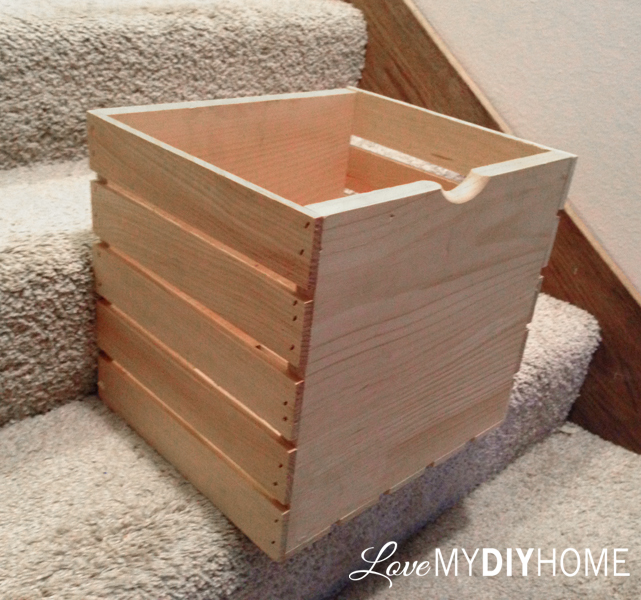 I love how bright and cheerful your crate turned out, Val! I bet the three of them look terrific under your tree – nice work! I love this idea. Thanks for sharing your talent with us! I love this idea so much! 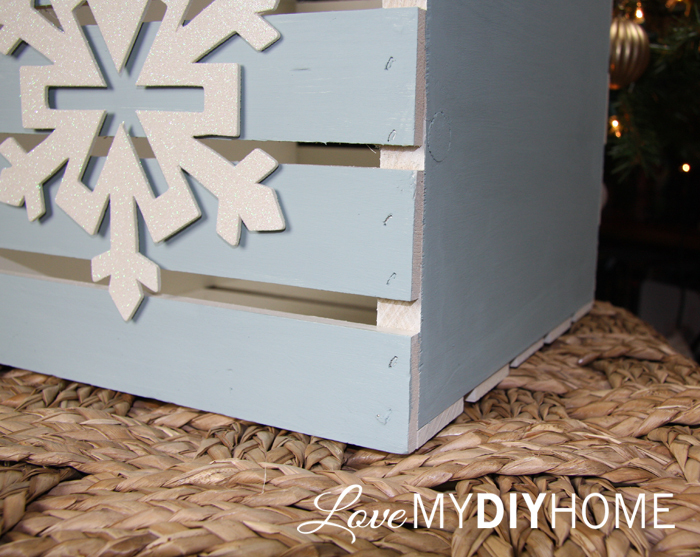 I'm so into crate boxes and this is such a great way to bring them into the holiday season! Thank you for sharing with us this week for Brag About It! This is so elegant! Love it! I love a good challenge, and you did such a great job! I love the color contrast and the sparkly snowflakes. These will be great to hold hats and mittens by the door after the holidays. I feel your pain on the needing a clean garage or paint, luckily it's not too cold here yet. Thanks for sharing with us at Welcome Home Wednesday Linky Party! Thanks, Tracy. I do love sparkles! Hi there Val, you really have a good taste of colors and I frankly speaking if I was put in your shoes and asked to come up with something like that, it could have been close to that. Thanks a lot for sharing. You have inspired me and I think I can make use of my old pallets that I am not using anymore.